It’s great when you read a band’s bio and you’re already excited, and then you hear the music and your excitement spikes further and you dive headfirst into their sparse sonic cocktail of British new wave and post-punk, with the merest hint of C86 jangle-pop – like the midpoint between The Horrors’ first two albums – with vocals that bounce from gobby inebriation to a Morrison-esque howl (if The Doors had formed in the late 70s in a Surrey commuter town, playing regular support to The Damned and The Stranglers, rather than a mid 60s Southern California on the brink of brief hippy utopia). Such is the case with Melbourne’s Teenage Mothers. 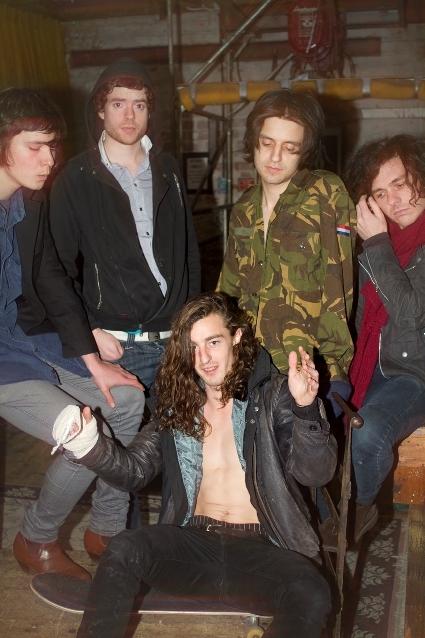 The five-piece are, by all accounts, pretty rawkus, having already been thrown off a lucrative tour with M83 for being a general nuisance, and enraging Aussie supermodel Miranda Kerr’s people with their song Orlando and Miranda (sample lyric: ‘Orlando, when she’s sucking you, do you thank your God of fame?’). Lead singer JK has also been camping out with Melbourne’s Occupy movement. Glorious stuff. The Horrors connection is no coincidence: The Mothers’ debut EP, released July 22 on Heart Throb Records, is produced by Bad Seeds and Grinderman drummer Jim Sclavunos, who was partly at the helm for Faris Badwan and co’s nightmarish 60s garage-rock pastiche Strange House.